When WHOI geologist Liviu Giosan first reconstructed the history of how the Danube River built its delta, he was presented with a puzzle. 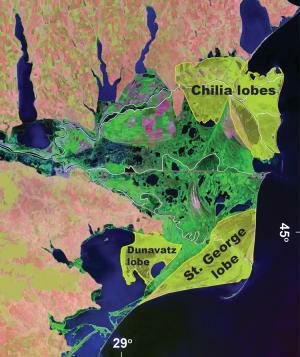 In the delta's early stages of development, the river deposited its sediment within a protected bay. As the delta expanded onto the Black Sea shelf in the late Holocene and was exposed to greater waves and currents, rather than seeing the decline in sediment storage that he expected, Giosan found the opposite. The delta continued to grow. In fact, it has tripled its storage rate. If an increase in river runoff was responsible for the unusual rapid build up of sediment in the delta, says Giosan, the question is, "Was this extraordinary event in the Danube delta felt in the entire Black Sea basin? And if so, what caused it?" In answering those questions, Giosan and an international team of collaborators including environmental engineers, modelers, paleogeographers, and paleobiologists pieced together a unique history of the region that ultimately provides evidence for a transformative impact of humans on the Black Sea over hundreds, if not thousands of years. The study was published on August 30 in Scientific Reports, a new online journal of the Nature Publishing Group. The largest and longest river in the European Union, the Danube is the source of over 60 percent of the freshwater running into the Black Sea, and therefore is a dominant factor in the biogeochemistry of this basin. 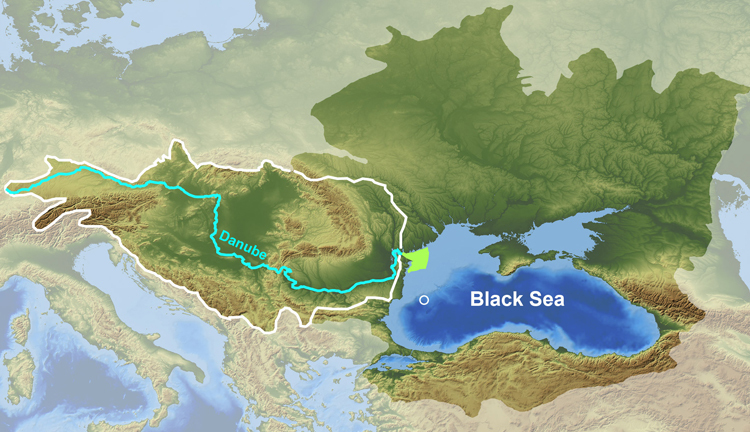 Because the Black Sea is nearly enclosed, changes in its hinterland provoked by climate or people should be readily reflected there. The research team reconstructed a 9000-year record of the delta's growth, and through various scientific techniques, developed and mapped against it a record of changes in the Black Sea's salinity, nutrients, and relative abundance of its ecosystem's major phytoplankton groups. Finally, they also examined the history of land use in the greater Danube watershed. To reconstruct the salinity, the WHOI team analyzed sediments containing highly resistant organic compounds called alkenones, which are uniquely produced by Emiliania huxleyi – the same photosynthetic organism oceanographers study to determine past sea surface temperatures. By examining the ratio of two hydrogen isotopes in the alkenones, they were able to map the salinity trend in the Black Sea over the last 6,500 years. "One of the isotopes, deuterium, is not very common in nature," explains WHOI marine paleoecologist Marco Coolen, "and it doesn't evaporate as easily as other isotopes. Higher ratios of deuterium are indicative of higher salinity." Salinity began to rise in the Black Sea about 9000 years ago, when the ocean invaded the previously freshwater lake through the Straits of Bosporus, and continued to increase until approximately 3000 years ago, when the levels approached normal ocean values. "But the trend since then is counter-intuitive," says Giosan. "The entire basin freshened, especially in the last 1,500 years." The likely explanation points to a increase in the river input combined with a reduced evaporation as the climate cooled at the time, he adds. Such an influx of nutrient-rich river water would affect the composition of the ecosystem, and would be reflected by the ecological history of major phytoplankton groups in the Black Sea, such as diatoms and dinoflagellates. Researchers traditionally conduct paleo studies of phytoplankton by using a microscope to count the fossil skeletons found in sediment cores. 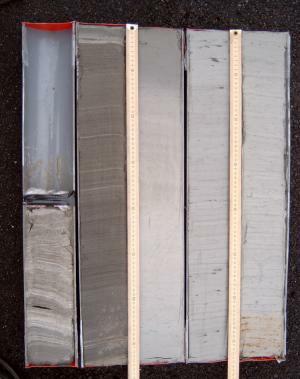 But, this method is limited because some phytoplankton leave no fossils, so, instead, Coolen looked for sedimentary genetic remains of the past inhabitants of the Black Sea water column. "DNA offers the best opportunity to learn the past ecology of the Black Sea," says Coolen. "Calcareous and organic-walled dinocysts are frequently used to reconstruct past environmental conditions, but 90 percent of the dinoflagellate species do not produce such diagnostic resting stages, but their DNA remains in the fossil record." His analysis found that major phytoplankton groups in the Black Sea changed drastically over the last millennium. Beginning about 500 years ago, a rise in diatoms suggests there was more silicate available in the Black Sea. The team at WHOI also found an increase in the abundance of dinoflagellate DNA beginning about 650 years ago. Both of these changes are consistent with increased nutrient availability that would occur as a result of human activity – the clearing of forests and increased agriculture. Interestingly, a significant drop in diatom DNA occurred in recent times when more recent human activity – the damming of the rivers – entered the scene. The final piece of the picture comes from a model developed by Jed Kaplan, a scientist at Ecole Polytechnique Federale de Lausanne in Switzerland. Kaplan looked at the expansion of lands cleared for agriculture in the Danube watershed as population grew and farming technology became more advanced over the last 7000 years ago. His findings agree very well with recently published studies of the relative abundance of grass pollen over tree pollen and the appearance of charcoal in the sediment record from clearing large swaths of trees by burning. All of these land signals point to human deforestation and increased agriculture. Modeled history of vegetation in the Danube watershed. Forests and other natural vegetation are shown in green hues and agricultural lands in red hues; regions with similar proportions of natural and agricultural lands are in yellow. Population growth and technological advances led to a rapid deforestation of the eastern part of the watershed since 1000 AD to before the start of the Industrial Revolution in the region after 1850. Figure courtesy Jed Kaplan, Ecole Polytechnique Federale de Lausanne The model suggests that deforestation of the lower basin of the Danube rapidly accelerated over the last millennium and especially in the last 500 years. In contrast in the western sector of the watershed, farther from the Black Sea, deforestation was already substantial as the Roman Empire expanded there. "This story started by looking at how Danube River built its delta in the Black Sea," says Giosan. "But together these indicators tell a story of changing land use that ultimately changed the ecosystem of an entire sea." The ability to define baselines and separate natural variability from human-induced changes is essential for understanding biogeochemical cycles and managing marine ecosystems, which ultimately depends on the detection and attribution of long term environmental trends, the authors write. "Our ancestors changed that baseline a long time ago in the Black Sea" says Giosan. "And they probably fertilized other coastal seas with nutrients inadvertently stripped from soils much earlier than we think." Meanwhile, the Danube delta remains an extraordinarily lush, vibrant habitat, home to hundreds of species of birds and fish. "This is a unique piece of land – the Danube delta – blessed, productive, and important for countless forms of life," adds Giosan. "What is amazing to me is that we owe much of this biodiversity to our own history of changing Nature."